Greetings everyone. It's Friday and I can't be more pleased as it brings to an end a very long work week. I'm in the mood for pancakes and melted butter but not on my head as this cute little bunny is sporting. I have no idea why this happy, little guy has pancakes on his head, I just know that it makes me laugh. Yup, that should solve the price of gas problem. 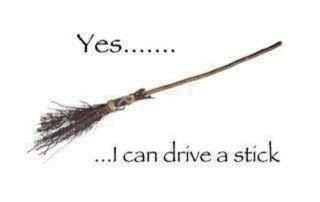 I can drive a stick and I do adore the wind in my face. 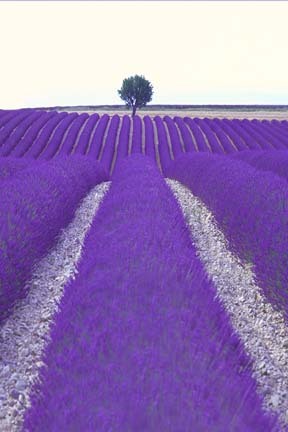 My favorite photograph of a lavender field in France. Just too easy to lay my body down in this field of purple and day dream the day away. Oh how I love these long days now that the time has returned to its true course. Couldn't ask for better weather this weekend, warm days, cool nights makes for a delightful day and great sleeping when the stars come out. Sis celebrated her birthday this weekend and we did a sisters run around. 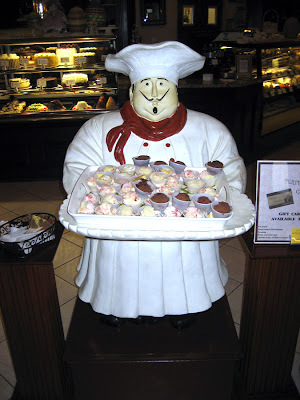 Started out with lunch at a real New York Trattoria and bakery. Something that is very, very hard to find in the metro Atlanta area. 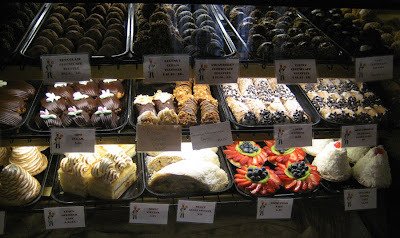 A lovely, 40 minute drive to Alpharetta, GA and we arrive at The Alpine Bakery and Trattoria. 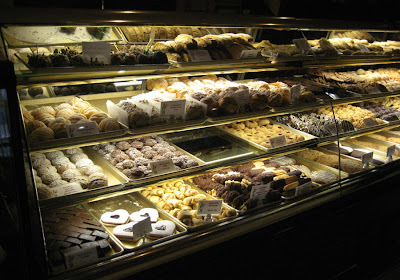 We open the heavy wooden and glass doors and the enticing smell (what I call the original aromatherapy) of Northern Italian dishes and baked goods greets us. This happy chef meets you at the entrance with a tray laden with samples of their signature cheesecakes. 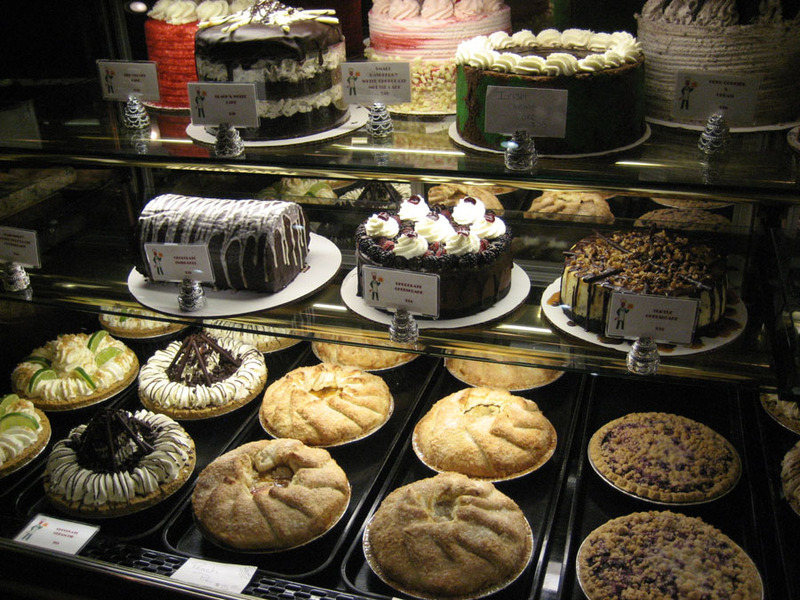 I couldn't resist sampling the chocolate fudge cheesecake...to die for. Beautiful homemade pies...the high crusts on these apple pies were amazing. Case after case after case of delectable choices. New York tea cookies, there is nothing like them. Regional differences can be like visiting two different countries and no where is this more evident than with the northern tea cookie. Most southerners despise them, saying they are dry, tasteless and dense. Northerners adore them because they are rich in butter and homemade preserves, drizzled with rich, dark chocolate and are perfect with coffee or tea and perfect for dunking in your favorite hot liquid of choice. 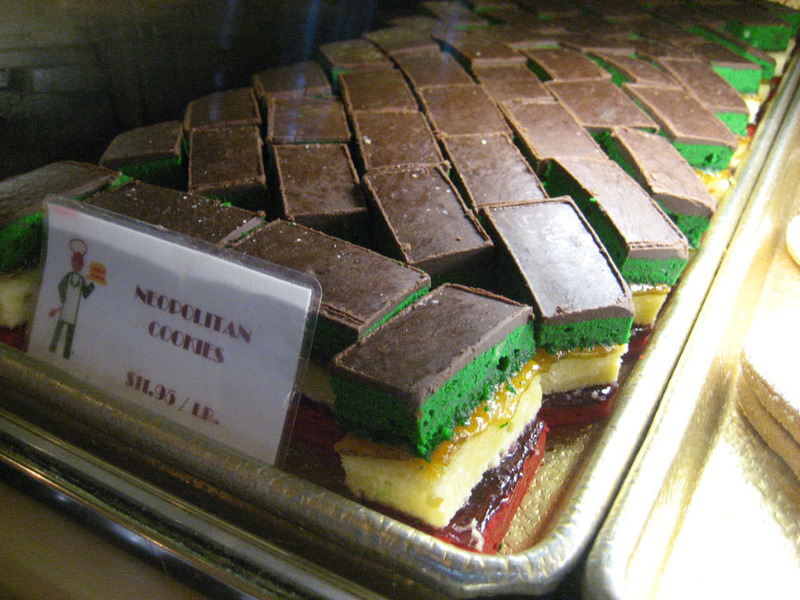 A personal favorite, Neapolitan Cookies, also known as rainbow cookies. This rich, cake like cookie has an almond paste base and the layers are separated by apricot preserves and raspberry preserves and then enrobed with rich dark chocolate. I make these over the Christmas holidays, and takes me all day to produce a huge tray full, but it is so worth it. This beautiful carrot cake measures 8 inches high and is so moist and rich with carrot shavings. 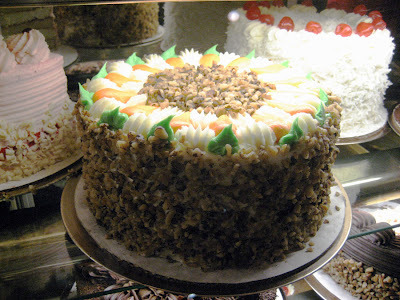 I brought home a big slice for my honey...it is his favorite cake. A tray full of "Paris Breasts". 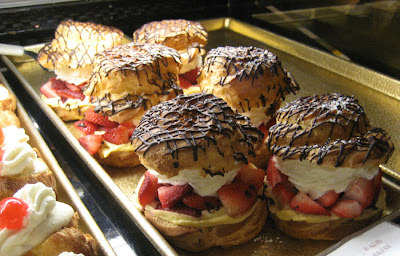 Lighter than air, they remind me of the pastry that Amadeus Mozart would have served. 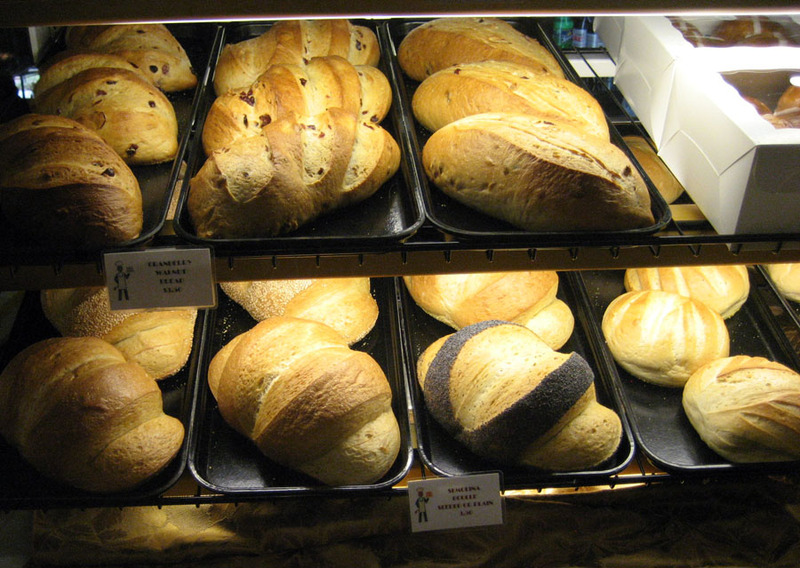 Oh, and the breads...the breads! Beautiful and full of flavor, truly the staff of life. We dined "Al Fresco" as it was a beautiful day. 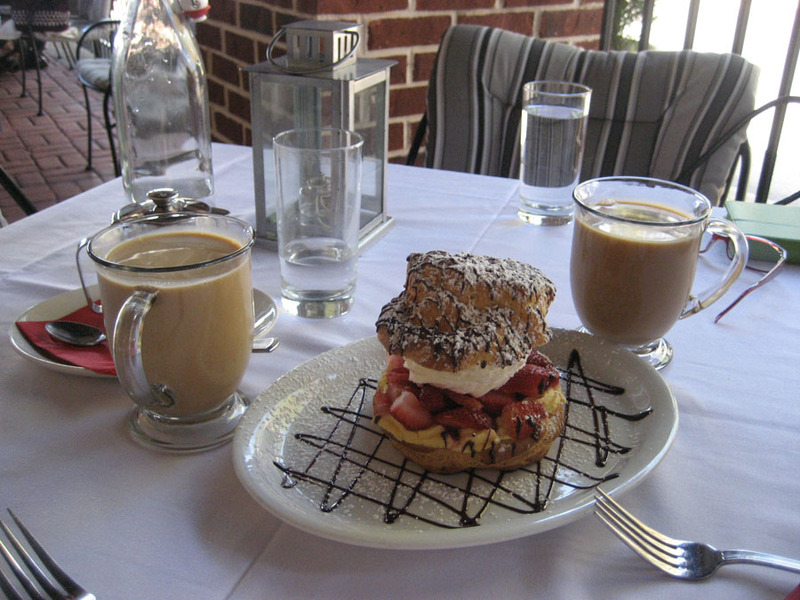 It was marvelous to sit and gossip and laugh and catch up on each others week and enjoy such marvelous board of fare. We knew we would have dessert so we chose to split our lunch. We shared a Baby Iceberg wedge with Pancetta, tomato, green onion, and maytag bleu cheese dressing...served icy cold. Our main course was Noodles (Fettuccini) Alfredo prepared in the classic Roman style. Homemade noodles cooked to al dente perfection, lightly tossed with Alfredo and fresh grated Parm. Alpine can boast their superb wait staff who provide attention but not overkill, so you really enjoy your dining experience. 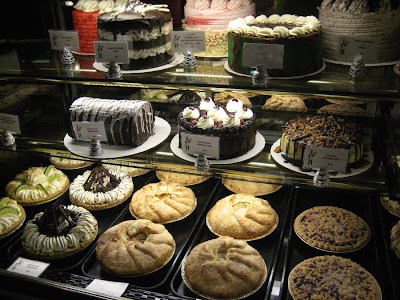 What did sis choose as her birthday dessert? It actually took about 10 grueling minutes of what to choose considering the miles of cases filled with edible perfection. But the "Paris Breast" won out along with steaming hot Italian coffee. Excellent dessert and filled with fresh strawberries, we could only put a dent in it and sis took home more than half for later indulgence. 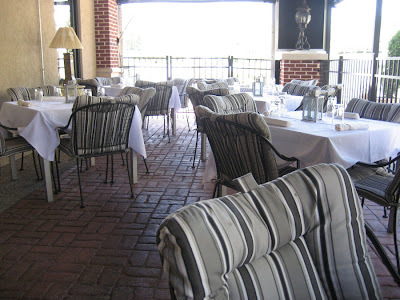 It was a lovely birthday lunch and I can't wait to take my honey to dinner there. From there we decided to do a little Good Will "hunting" and so we took off for our favorite location. 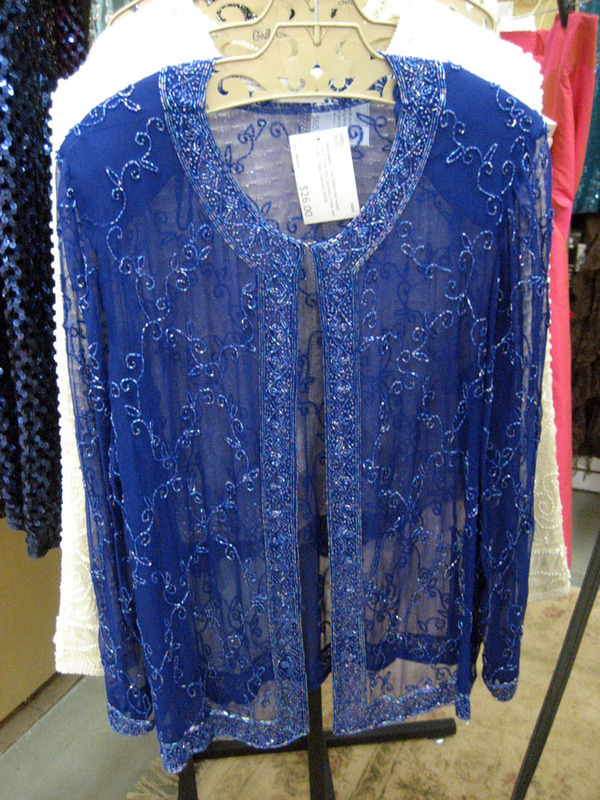 Found a few marvelous beaded pieces for my Girdle Gals booth. 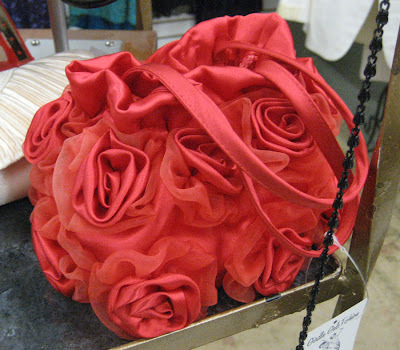 How adorable is this pretty little red silk roses evening bag. A nice Very Wang ombre bag and sassy hats make a nice display. Found three additional bags just perfect for spring and all were new, with tags. 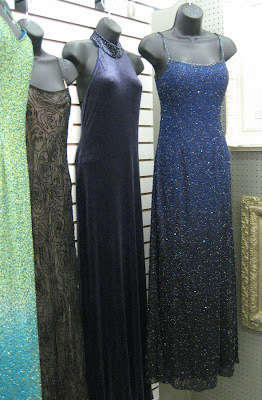 Lovely beaded gown in blue melting into black. 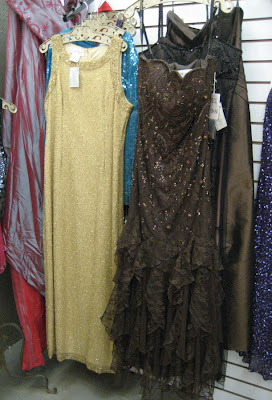 Nice vintage gold beaded gown is perfect for a cruise and this chocolate brown Dolce Jovani is new, with tags and perfect for a prom. In addition to clothing, I came across a few neat pieces for my other booths. Wonderful, vintage bride's cake knife with a mother of pearl handle. Unusual wooden book stand. Pretty little thing. 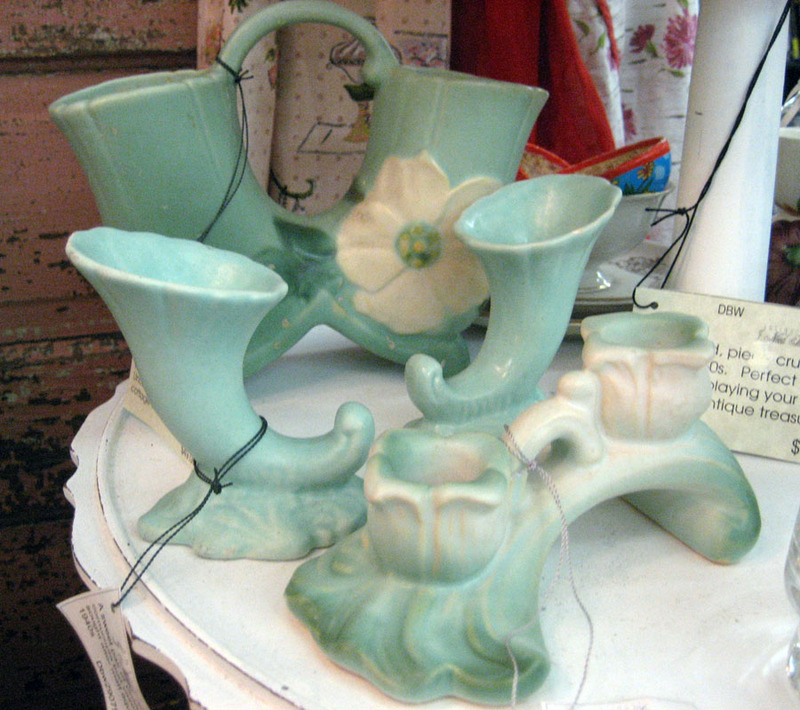 Found a pair of twin pottery flower vases and a twin candlestick. Love these muted blue greens. 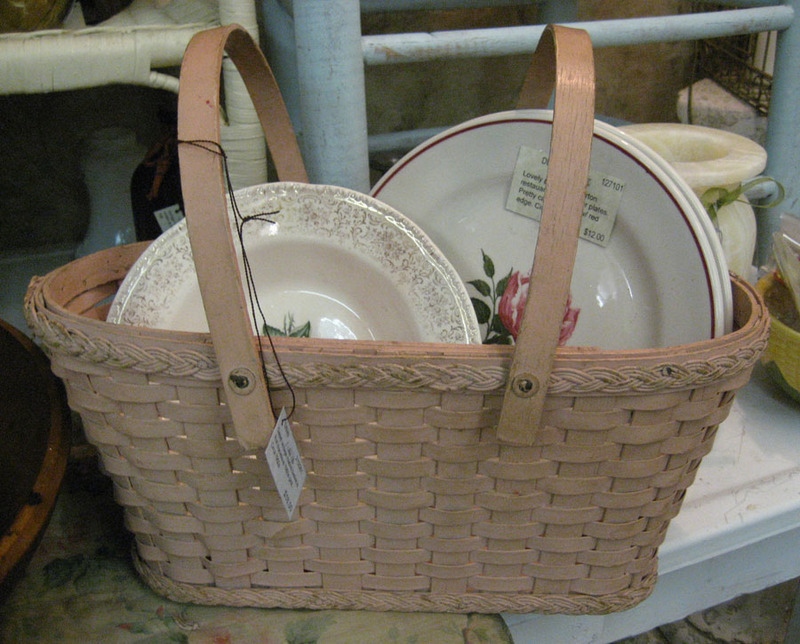 Sweet, muted pink market basket with drop handles is perfect for holding these vintage plates and bowls. I like the way the booth is looking for spring. 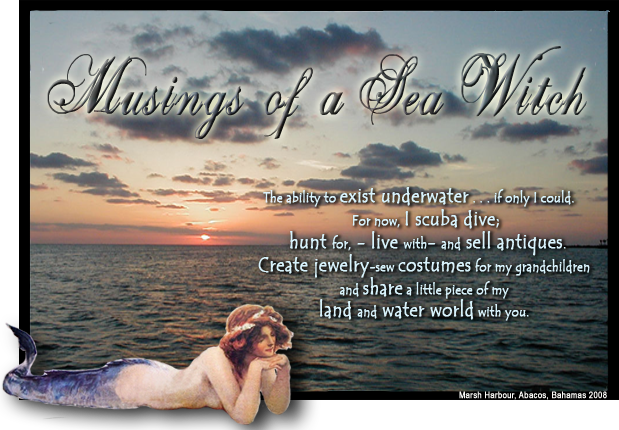 I have more beachy blue items to bring in next week. 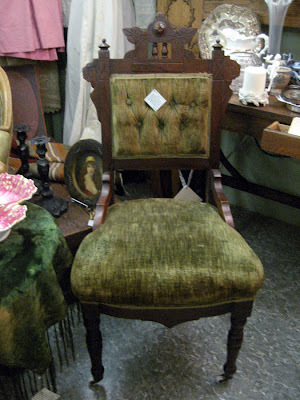 Didn't find this lovely Eastlake chair at Goodwill, but did find it at one of my favorite thrift haunts. Original upholstery and marvelous patina on the walnut. A post civil war piece from the 1870s. 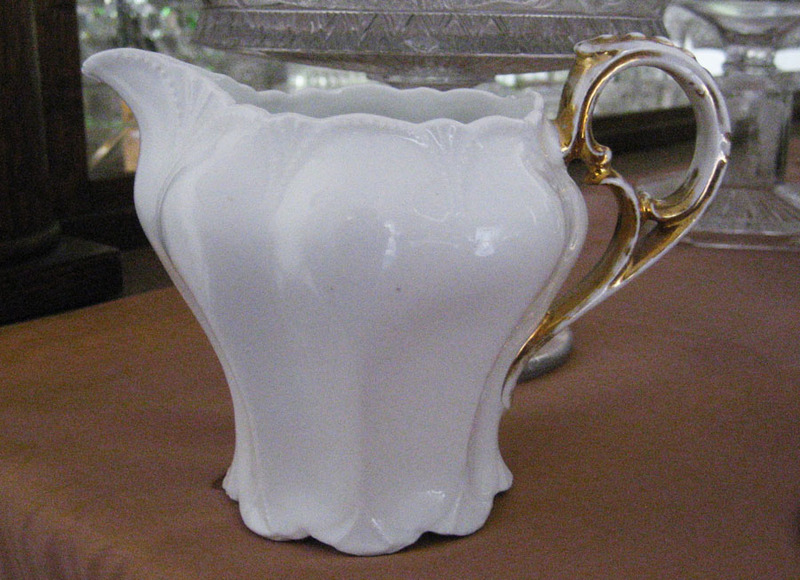 Last but not least, a pretty little beaded white creamer. It was a delightful weekend with celebrating my sister's birthday, schlepping through thrift stores and lunch at the Alpine Trattoria and Bakery. I hope everyone had a lovely one as well. I got the fever bad...just loving this weather in the south. Sunny days, flowering trees in full bloom, and the yard sales are popping up like daffodils. Really want to take the week off and just enjoy all of it at my leisure, but this working gal has got to keep her nose to the grindstone, like so many, I need my medical benefits. Not complaining, mind you, just want to play for a few days more. 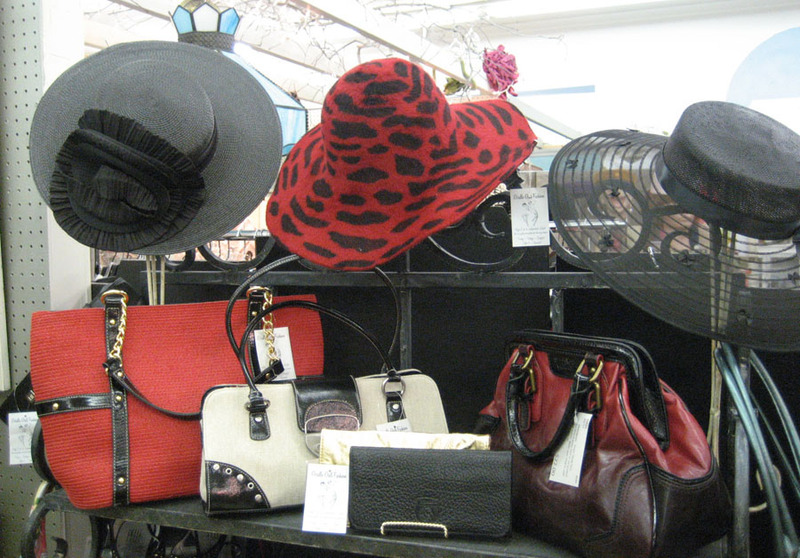 Made a visit to Vintage Village in Snellville, GA to see what their spring had to offer. 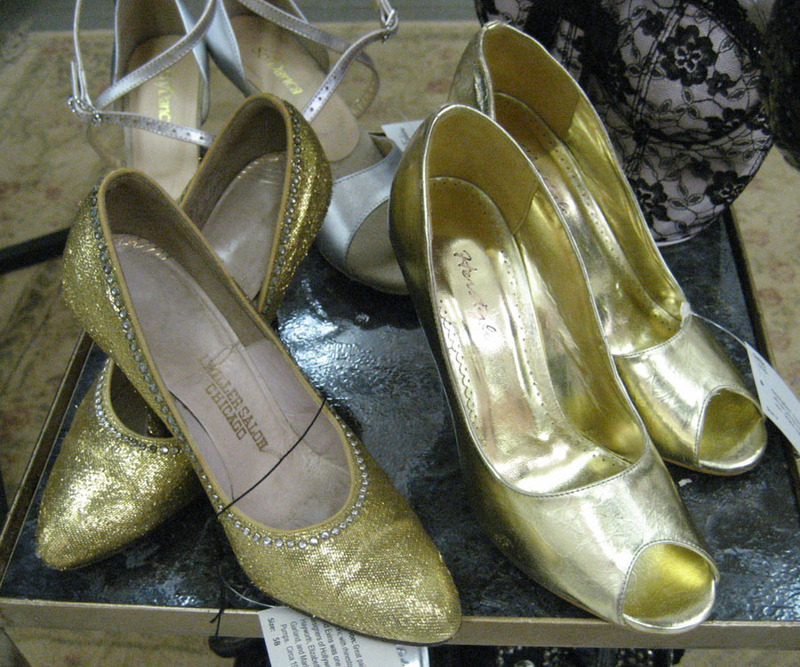 I always find treasure when I come to VV and got to spend time with old friends to boot. 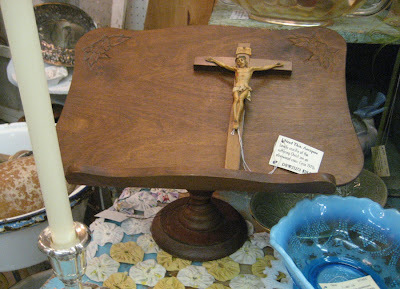 This sweet little vintage easter honeycomb table display caught my eye and I may still go back and get it. Just too sweet. Be still my heart, I adore antique transferware and this pretty soup tureen had my heart racing. One of my favorite dealers at the Village. You could just live in Paul and Jeanine's booth as it is so comfy cozy. Grab a book and a beverage and I can easily nest in here. The booths are packed to the rafters. 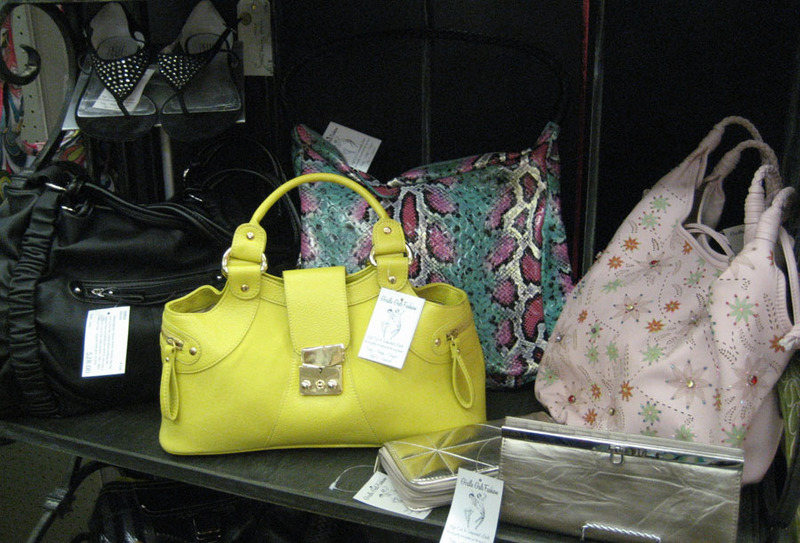 Many of the dealers have echoed the same story that other dealers are buying again. Maybe the economy is beginning to turn around again. I certainly hope so. What I liked about these paint by numbers best is that they were unfinished. Pretty silhouettes for your windows and your walls. These spring yellow chairs are just yummy. 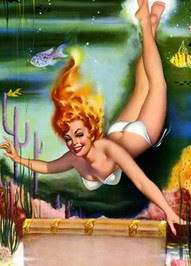 Cabin fever, not here...unless you are looking to feverishly fill your cabin with fun pieces. This dealer has marvelous, antique books. I picked up a huge 1867-88 history book with lots of old illustrations. 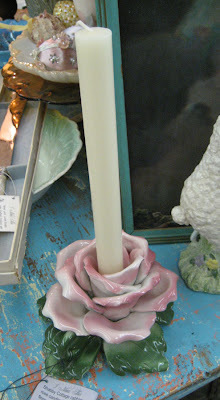 It's always fun taking a trip to VV as I find nifty things and get to gossip with old friends. From there, I moved on to other favorite haunts and found a few more pieces I had to have. How about this pretty heart. Yup, it's a flask and holds about 1/2 cup of your favorite libation. Not sure what I am going to do with it yet. Like a crow, I am easily distracted by shiny objects and this one still has my attention. Found this Barbi doll type painted bust at Vintage Village. I got a thing for heads and there are kindred spirits who love to display them as well. How magnificent is this huge, treenware chopping bowl? Fantastic patina, this bowl just begs to be taken home. If this doesn't sell, I won't be disappointed, wink! wink! Found a pretty little breakfast set of English bone china. Two plates, teacup and saucer, egg coddler and personal teapot with pretty blue ribbon, posies and embossed basketry pattern around them all. A darling find at Vintage Village, this dealer marries up different items and creates pretty little things. I fell in love with this old hoosier cabinet door with a mounted etching pinned to it. It did have a silver ribbon around it, but I removed that...thought it was "too" much. Another piece that I won't mind if it doesn't sell. Sigh, I keep trying to downsize my life, but there are too many pretty things out there that follow me home. Wonderful find, this sterling Kiddush Cup is from turn of the Century Russia. Hand etched with the Star of David and wheat and the hand engraved initials H L. I wonder if my Grandma Nana (great-grandmother) had one of these stowed away in her carpet bag as she immigrated from Minsk to NY in the 1880's? 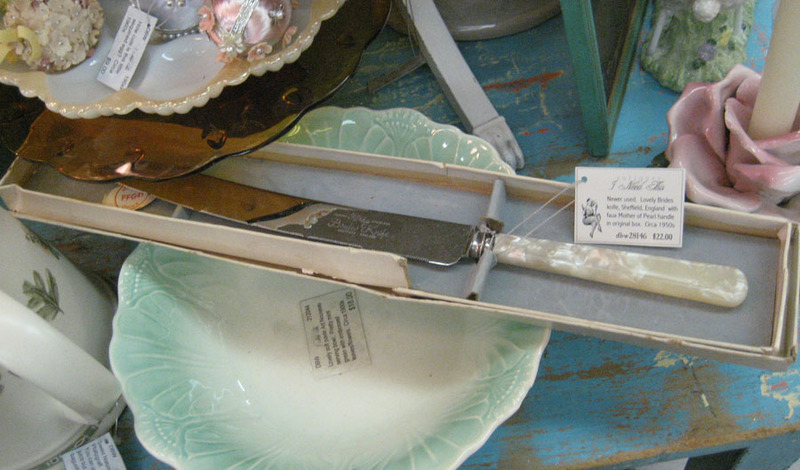 Lovely EAPG, Baltimore Pear, spooner in rare color. Adams Glass Co. 1874. I filled with William Rogers silverplate berry spoons. My main booth is packed with treasure. As you can see, I hung the stained glass piece on the back pegboard. I had sold other pics off that wall last week so it freed up a lot of space. The stained glass window is big and looks so much better hanging then leaning against furniture. 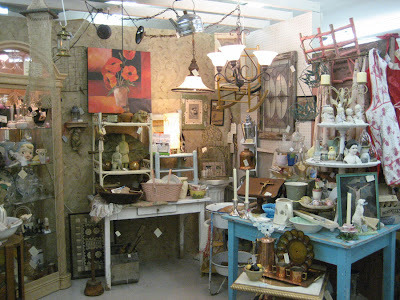 Was on the lookout for a piece of furniture that I could use in my Girdle Gals booth to use as a pseudo accessories wall. Wanted something that would have a salon look that wouldn't compete with the items I would display. I think it looks very French Quarter with its scroll work. As sea witch luck would have it, I fell into this lovely wrought iron Bakers rack with metal shelves. Big, heavy and with lots of room, this piece is exactly what I was looking for and got it for a great price. Here it is filled with accessories. Have to find a few risers so I can make good use out of all of this space. A corner shot of Girdle Gals. It's coming along nicely so far. 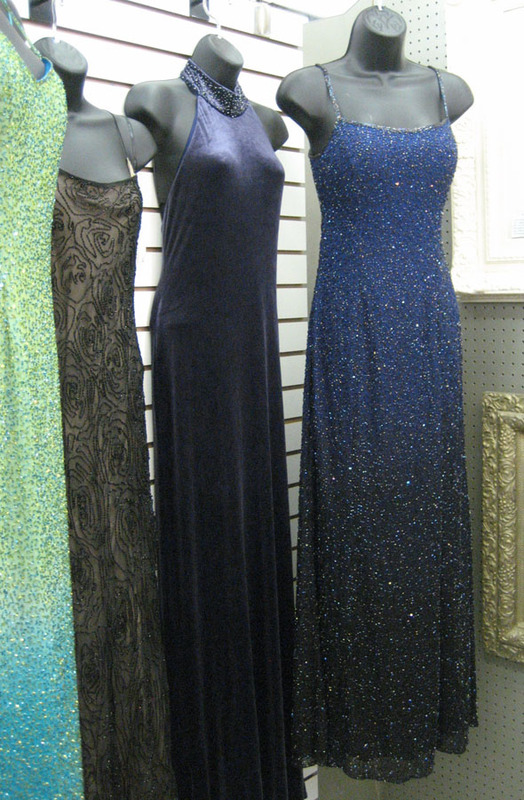 Brought in more beaded pieces as they are just now starting to move. Last, but not least...a find just for me. I adore antique quilts and although I only have two that I actually own, this one will go into that collection. This Victorian beauty quilt pattern is hand pieced from silks and velvets and called "A Thousand Pyramids." A closer shot of the pyramids. These are no bigger than a stand size postage stamp and all are hand pieced together. There is shredding in places as silks like this disintegrate with age. The red silk edging is dry rotted and in shreds. Still, it is just amazing at the workmanship that went into this piece. And a closer look. I know this is a quilt that many folks would turn their nose up because it is not in pristine condition and others would use it as a "cutter" quilt for other creations, but I love it for all of its age and glory. For now, I have it in a cotton bedsheet, gently rolled up and stored for its protection.